absolutely sterling job! I'm inspired to look for that book and have a crack myself! I'll be honest, the fabric covering isn't to my taste, but then it isn't on my head! So, a career as a milliner for you? I love that you provided pictures of every step as you went along. I'm not sure my skills are up to something like that yet, but it's very encouraging! Your hat is a truely wonderful creation, congratualtions sir. I tried looking up the book you mentioned and only came back with results around £45 on Amazon. Is it a rare book or am I looking for the wrong thing. Another vote here for a sticky to be made of this thread. A most elegant piece of work, sir! If you all want this sticky you don't have to vote all you have to do is ask. And that is a lovey hat. I have been making some of my own but they are far simpler. Unfortunately the book is on loan to me from my sister, so I don't know how much it costs or if it's even in print. Sorry. It's a wonderful hat, and very good instructions. The covering is not what I would wear, but taste is taste. Next to it is the picture that inspired me to make it. I usually have a pair of flying goggles attached to it. You know, you might just have inspired me to make another! That's nuts, Cubinoid! Love it! Just out of curiosity, but what is the right name for that style, anyone? It isn't just a topper, is it? 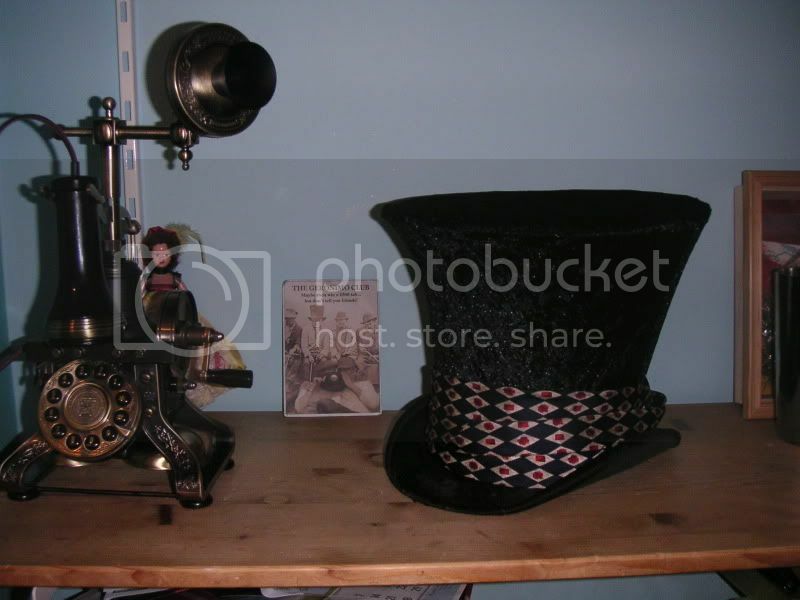 It wouldn't look totally out of place with a card sicking out of the hat band with "In This Style 10/6" written on it! Why thank you Professor! I've no idea what the style is called - but it is a fantastic look. Very intimidating! Just from the very nice step by step pictures and description I am almost inspired to make my own. However I do not have the patience to actually do all the hand stitching you do. Yet still I am inspired even knowing I would never actually finish it unless I broke a leg or something. I love making things with my hands but sewing isn't one of the things I enjoy, But I am almost inspired to do it anyways. What I am getting at is that this is a very well done How-To thread I enjoyed reading it from beginning to end and enjoyed watching the progress. It is an inspiration to those who have thought about making their own and those who never thought they would want to. That actually reminds me of a slightly exaggerated Empire or Wellington style topper (on which I believe the mad hatters was based). A rare hat indeed to find an original of. 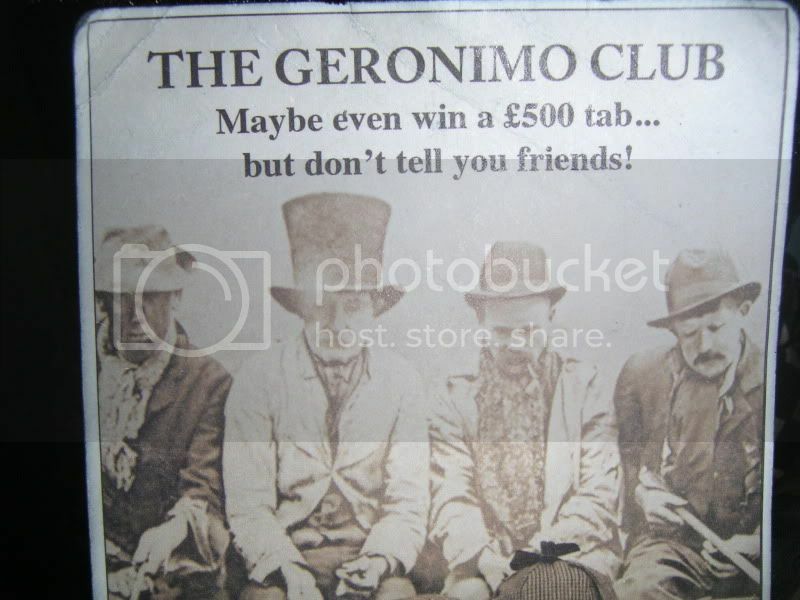 For some reason they make me think of Bill Sykes and bullseye, wonderfully thuggee hehe! Only just came across this thread, a most excellent hat and a most excellent guide. "Remember that you are an Englishman, and have consequently won first prize in the lottery of life." Very good work indeed. Well done! Most admirable and inspiring, thank you, Sir. A website for the book that Sam said he used. You can order the book from the site at USD $25 + $5 P&P. I wont say i dont have the skill but i certainly do not have the patience and precision to complete a project to this quality.. very impressive sir..
Sam Watson, you have made a fine Chapeau indeed. Might one say you were...Mad as a hatter? OK, so I seriously just bought the book. Sam, you ought to also make a waistcoat with the same material. Now THAT would be smashing! Thank you for all your pictures, too. That was great! Bow down! I love it! Fantastic worksman ship and sublime finish! Tophats are my favorite type of hat so i really do admire this! Nicely done! I'm usually not partial to stripes on hats, but you may make a convert of me, sir! This is lovely work you have here. I applaud you. Also, I agree with the Prof. Crayborne-- a matched waistcoat would look quite dashing. I, also, wish to tip my hat to you sir. Fine work. Hand made almost always takes top shelf to mass produced and yours has upped the anty! Hmm, I wasn't sold on the matched waistcoat at first, but the more I think of it, perhaps you're right. 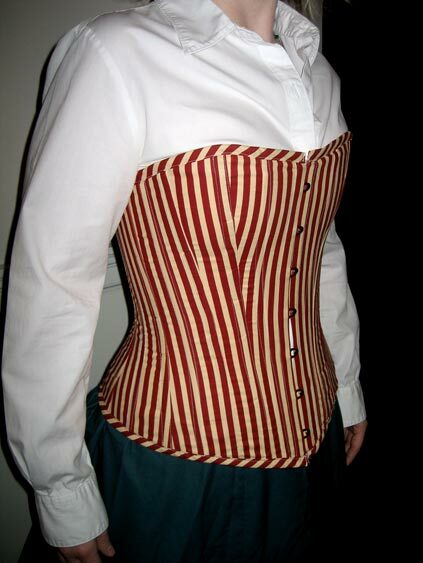 I'm definitely going to make a matched striped waistcoat to my wife's corset. I've never seen a suit that matches the hat before. Simply sterling job. I like the idea of matching waistcoat and corset.